This is a tremendous multiplication fact intervention. 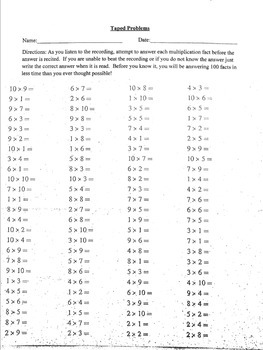 I have used it with great success with my fourth and fifth grade math classes. In only seven weeks of 3-4 times per week of use, students have increased their accuracy by 12.5%. In this same time, students have decreased their time to solve 100 problems from 12:05 to 4:44 on average. This is a 61% speed improvement in only seven weeks! The best part is that students are given the answers and do not feel any pressure. This has been one of the best things I have ever implemented. This item was part of my MA completion project.